Next of Kin: Eldest son of Mr and Mrs Edwin Haffield of Page's Cottages, Poolbrook; husband of Mrs A E Haffield of Pound Bank, Malvern. Thomas Haffield was born in 1885, the first son of Mr and Mrs Alfred Haffield of Poolbrook. He enlisted in the Worcestershire Regiment and was posted to the 9th Battalion, which had served at Gallipoli and was then serving in Mesopotamia. He was killed on the 25th January 1917 during the relief of Kut. He left a widow, who was informed of his death in February 1917. 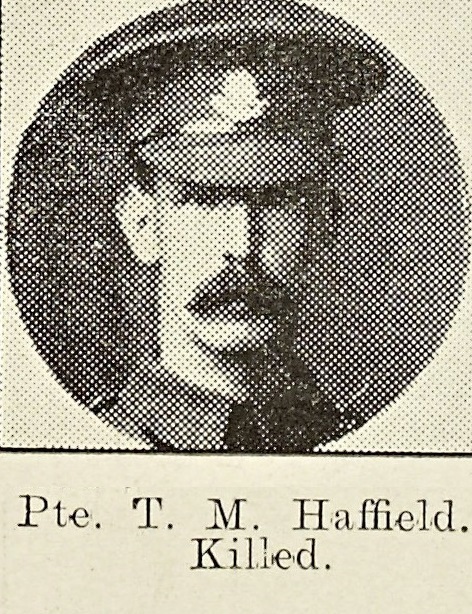 He had five brothers who also served in the Great War – they were: L R Haffield, Royal Horse Artillery; Pte Edwin Harry Haffield, Worcestershire Regt; Sgt (later 2/Lieutenant) C C Haffield 2/8th Worcestershire Regiment and, Pte H Haffield Worcestershire Regiment. Edwin, who joined the Colours in September 1916 was wounded the following September; Gnr L R Haffield was wounded in October 1917 and Lieutenant Haffield was taken prisoner in the German Spring Offensive of 1918. He was freed in January 1919 and was a member of the Committee of the Malvern Prisoner of War Club.